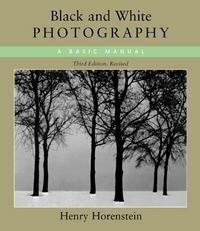 Black and White Photography 3 Edition BLACK & WHITE PHOTOGRAPHY is a comprehensive instructional book that covers every element of photography. Henry Horenstein's books have been widely used at leading universities, including Parsons School of Design, Harvard, Yale, Princeton, and MIT as well as in continuing education programs. Horenstein is a professor at the Rhode Island School of Design. BLACK & WHITE PHOTOGRAPHY is a real bargain among photographic how-to books.